In this Falling Leaves craft the leaves actually fall! 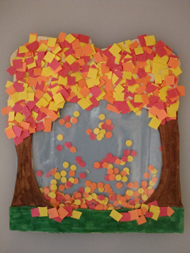 This is a really fun craft for autumn or when learning about the seasons. If you change the color of the leaves to green you could call it a "Windy Day" for a great weather craft! Preschoolers can do this craft if an adult cuts out the template for them ahead of time! 1. Cut off the part of the baggie that is above the zipper, but don't cut off the zipper! 2. Cut out the falling leaves scene and color the tree trunks brown and the grass green. Trace around the rectangle template onto some sky blue paper and cut it out - this will be the background. 3. Cut out small squares of red, orange and yellow paper. Glue them onto the tree. The easiest and quickest way to do this is to spread glue all over tree and stick on each "leaf". 4. With a hole punch make a bunch of yellow, red and orange circles. Put 1½ tablespoons of paper circles into your baggie. Seal the bag, but make sure you don't squeeze out all of the air or the leaves won't fall right. Test the leaves, you can add more or less air to your bag if you need to (more air makes them fall faster, less air makes them fall slower). 4. Get all the paper circles into the center of the bag. Sandwich the baggie between the two papers by spreading glue along the edges of the baggie, front and back. Also spread glue on the outer edges of the paper window. The blue rectangle is glued behind the baggie, and the fall trees is glued on the front. Now shake your fall scene and watch the leaves fall! It will take a few minutes to punch all those holes, you could also just cut small squares, which may be quicker, but make sure they are about the same size as a hole punch.